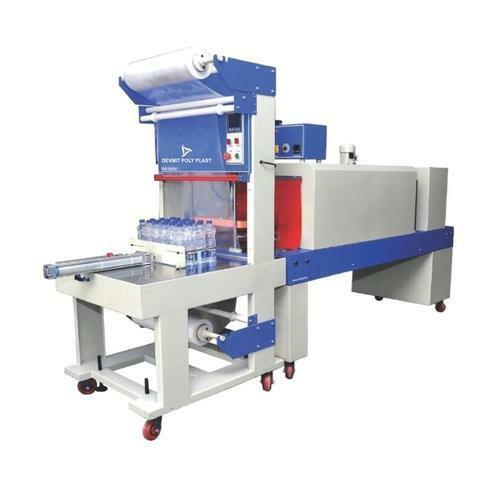 Innovative Modern Semi Automatic Web Sealer Shrink Wrap machine with 60 Bottles Per Minutes Speed. Established in the year 2006, We “Devmit Poly Plast”, are one of the renowned manufacturer & exporter of outstanding quality collection of LD shrink bundling fillm, Semi Auitomatic Shrink Machines with Web Sealer, PE Shrink Film (Heat Shrink Film), Garbage Bags, Trash Bags, LD Foam Sheet, LD Foam Roll, LD Foam Calendar, LD Plastic Tarpaulin, Milk Pouch Film, Packaging Films, LD Garbage Bags, etc. The offered products are precisely manufactured by utilizing quality assured raw material and contemporary machines under the supervision of our hard-working professionals in compliance with set industrial standards and norms. We are a Partnership firm and have developed an ultra-modern and huge infrastructure unit in Rajkot (Gujarat, India) which spreads over a huge area of land and is equipped with upgraded manufacturing technology. Our infrastructure unit is segregated into various sub-units which include production unit, quality testing unit, research & development unit, warehouse & packaging unit, sales & marketing unit, etc. Each unit is managed by an adroit team of professionals who works in close coordination with each other and also with the clients to cater their needs. With the support of our dedicated and diligent team of professionals, We are able to attain a prominent place in the industry. Our professionals use their skills and knowledge in the production process that assists us to improve the quality of the provided products. Under the skillful guidance of our mentor, “Mr. Deven Dhaduk”, We are able to cater the varied demands of our valued clients. Owing to his in-depth knowledge and rich experience, we have achieved predetermined organizational goals efficiently.